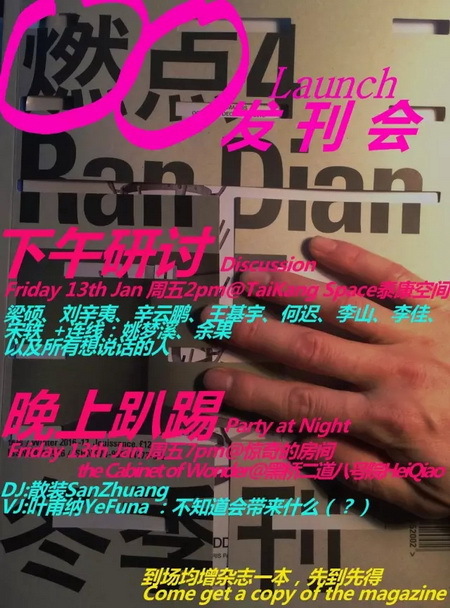 Come get the latest issue of Ran Dian! Liang Shuo, Liu Xinyi, Xin Yunpeng, Wang Jiyu, He Chi, Song Yi, Alessandro Rolandi, Li Jia. Discussion in Chinese: on the topic of happiness, pleasure, and jouissance. Join our party in Heiqiao! Liquor and snacks provided. Bring your own gas mask. No. 8 Heiqiao Erdao Art District will be the first section to be taken down by the local authorities—a harbinger of the disappearance of Heiqiao, along with its artistic milieu. The not-for-profit art institution Taikang Space has been a long-term partner of cooperation with Ran Dian. In terms of intellectual methodologies, critical stances, and neutrality, our commonalities lay a good basis for future cooperation. We must also express our thanks to the “Cabinet of Wonder” for providing the party venue.